امروزه با گسترش فعالیت‌های انسانی، ارزیابی کیفی و کمی منابع آبی به‌ویژه در مناطق خشک و نیمه‌خشک جایگاه ویژه‌ای در مطالعات منابع آب پیدا نموده است. یکی از شاخص­‌های ارزیابی کیفیت آب، اندازه‌گیری مقدار غلظت یون‌های اصلی موجود در آب است. به‌منظور بررسی تغییرات مکانی، شاخص کیفیت آب زیرزمینی (GQI) که تلفیقی از پارامترهای مؤثر بر کیفیت آب می‌باشد، مورد استفاده قرار می‎گیرد. در مطالعه حاضر به‌منظور بررسی نحوه توزیع یون‌های اصلی شامل کلسیم،منیزیم، سدیم،کلر،سولفات وکلموادمحلول (TDS) و پهنه‌بندی کیفی دشت یزد اردکان، شاخص GQI با استفاده از نرم افزارArcGIS برآورد شد. برای بررسی وضعیت تغییرات زمانی و مکانی شاخص GQI در دشت یزد- اردکان از آمار 53 چاه‌ پیزومتری وابسته به وزارت نیرو (شرکت آب منطقه‌ای استان یزد) استفاده و نقشه‌های پهنه‌بندی کیفی سال‌های 1382، 1385 و 1390 تهیه شد. نتایج نشان داد که دشت یزد- اردکان در کلاس‌های متوسط و قابل قبول از نظر شاخص GQI قرار دارد. بیشترین و کمترین مقدار شاخص GQI به ترتیب در غرب و شمال دشت مشاهده شد. شاخص خود همبستگی فضایی موران1، شاخص GQI و همه متغیرهای شیمیایی مورد بررسی به جز منیزیم دارای الگوی توزیع مکانی خوشه‌ای هستند و منیزیم دارای الگوی توزیع مکانی تصادفی است.با توجه به نتایج به‌دست آمده از میان شش پارامتر مورد بررسی سه پارامتر موادجامدمحلول (TDS)، سدیم و کلر با داشتن بیشترین ضریب رتبه‌بندی به ترتیب دارای بیشترین تأثیر در مقدار شاخص GQI و در نتیجه کیفیت آب زیرزمینی هستند. در مجموع می‌توان نتیجه گرفت که روند شاخص GQI در منطقه مورد مطالعه نزولی است و کاربری اراضی نقش بسیار زیادی در کاهش میزان شاخص GQI و در نتیجه کیفیت آب‌های زیرزمینی دشت یزد-اردکان دارد. Water is the principal source of economic development, social security and poverty reduction. The value of water source leads to enhancement of management measures to maintain its quality and quantity by communities. Environmental changes and human activities effect on the quality and quantity of water. Urban growth, increasing industrial activities and overuse of chemical fertilizers in agriculture result in pollution of groundwater and surface water which have adverse effect on the health of human beings, animal and plants. Groundwater is the primary source to supply agriculture and drinking water hence recognition and awareness of groundwater quality and the water classification based on the number of various elements of them will assist us in making management decisions and decline groundwater pollution. Groundwater is particularly important in arid and semi-arid areas. On the other hand groundwater deterioration, both in quantitative and qualitative terms is important in water resources management of these areas. The concentration of common ions in water is one index for assessing water quality. Groundwater quality index (GQI), a combination of parameters for water quality, that constitute a reliable tool in defining aquifer vulnerability is used to investigate the spatial variability. GQI shows the data related to the water quality in an explicit manner. This index presents a way of summarizing the overall qualitative condition of water which is understandable for the audience. Yazd-Ardakan plain has been faced with significant reduction of groundwater level in recent years. So, it is expected that the studying groundwater quality index can be effective for aquifer management in this plain. In this research GQI was used in order to study the distribution of major water ions including Calcium, Magnesium, Sodium, Chloride, Sulfate and Total Dissolved Solids (TDS); and zoning groundwater quality using ArcGIS10.1. The data of 53 piezometric wells provided by Iran Water Resources Management Company were used to study the status of temporal and spatial changes of GQI in Yazd-Ardakan plain. Water quality sampling campaigns were conducted during most vulnerable periods of early and late summer to ensure the representativeness of the targeted GQI under worst case conditions. Quality zoning maps were provided for 2003, 2006 and 2011. For this purpose, data were evaluated in GS+ 5.1 software, after calculation, the best model with the lowest estimated error was selected for zoning water quality parameters. Because of the lowest estimation error, Kriging, Gaussian and Spherical variogram models were selected as appropriate interpolation method for zoning the quality parameters. WHO standards were used to compare and investigate the quality status of the water. The water qualitative groups in the GQI map were divided into 5 classes of good, acceptable, medium, inappropriate, and poor, scoring from 0 to 100. The class which is close to 100 shows better quality and the class which is close to 0 shows lower quality. The results showed that Yazd-Ardakan plain is located in average and acceptable classes according to GQI index. The highest and lowest amount of Groundwater Quality Index (GQI) were in the west and north of the study area, respectively. Moran's I spatial autocorrelation index, GQI and all chemical studied variables except for magnesium have cluster spatial distribution pattern, but Magnesium have random spatial distribution pattern. Three parameters of Total Dissolved Solids (TDS), Sodium and Chloride having the highest coefficient ranking have a highest impact on GQI, respectively. On the other hand, these parameters have a high weight and GQI is more sensitive to them. In fact, these components in Yazd-Ardakan plain groundwater have more impacts on GQI model and their removal will cause greater changes in GQI. Therefore, they should be carefully evaluated and monitored. Generally, it can be concluded that GQI has the descending trend in the study area and land use has the important role in reducing GQI index and water quality. It can also explain the overall quality of groundwater and its threats in various uses of water. Finally, the regions with poor groundwater quality can be targeted for detailed studies and monitoring programs. According to the results, due to the nature of natural phenomena such as drought, their complete removal is not possible. The only principled way to prevent dangerous consequences of the water table decline and reduction of groundwater resources quantity and quality is the correct and systematic use of water and avoidance of uncontrolled groundwater withdrawal. 1- برتاو، حاجی‌نژاد، عسگری، گلی؛ عیسی، علی، علی، علی؛ (1392)؛ بررسی الگوهای سرقت مسکونی با به کارگیری رویکرد تحلیل اکتشافی داده‌های فضایی، مطالعه موردی: شهر زاهدان، پژوهش‌های راهبردی امنیت و نظم اجتماعی، سال دوم، شماره پیاپی 6، شماره دوم، صص 1-23. 2- جودوی، زارع؛ عطاءاله، محمد،(1388)؛ معرفی شاخص GQI به منظور ارزیابی کیفیت آب زیرزمینی جهت اهداف آب شرب،‌ بیست و هفتمین گردهمایی علوم زمین و سیزدهمین همایش انجمن زمین شناسی ایران،‌ سازمان زمین‌شناسی، تهران. 3- جهانشاهی، روحی مقدم، دهواری؛ افشین، عین الله، عبدالمجید؛ (1393)؛ ارزیابی پارامترهای کیفی آب زیرزمینی با استفاده از GIS و زمین آمار (مطالعه موردی: آبخوان دشت شهربابک)، نشریه دانش آب و خاک، سال 24، شماره 2، صص 183- 197. 4- خسروی، حیدری علمدارلو، زهتابیان، بذرافشان؛ حسن، اسماعیل، غلامرضا، جواد؛ (1394)؛ بررسی روند زمانی و مکانی شاخص منابع آب زیرزمینی (مطالعه موردی: دشت یزد– اردکان)، تحقیقات مرتع و بیابان ایران 22، 4 (1394): صص 711-720. 5- دشتی برمکی، رضایی، صابری نصر؛ مجید، محسن، امیر؛ (1393)؛ ارزیابی شاخص کیفیت آب زیرزمینی (GQI) در آبخوان لنجانات با استفاده سیستم اطلاعات جغرافیایی، نشریة زمین شناسی مهندسی، سال هشتم، شمارة 2، تابستان 1393،صص 21-38. 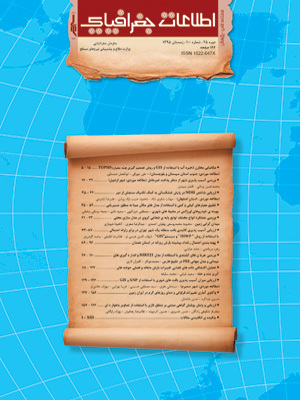 6- دین پژوه، فاخری‌فرد، حسن پور اقدام، بهشتی وایفان؛ یعقوب، احمد، محمدعلی، وحیده؛ (1394)؛ تحلیل روند تغییرات کیفیت آب زیرزمینی در دشت شبستر‌- ‌صوفیان، مجله علوم و مهندسی آبیاری، دوره 38، شماره 1، صص 55-69. 7- زهتابیان، جانفزا، محمدعسکری، نعمت الهی؛ غلامرضا، عنایت الله، حسین، محمد جواد؛(1389)؛ مدلسازی توزیع برخی از خصوصیات شیمیایی آب‌های زیرزمینی (مطالعه موردی در حوضه آبخیز گرمسار)، فصلنامه مرتع و بیابان، جلد 17، شماره 1،صص 61- 73. 8- سلیمانی، محمودی قرایی، قاسم زاده، سیاره؛ سمیه، محمدحسین، فرشته، علیرضا؛ (1392)؛ بررسی تغییرات کیفی منابع آب باختر کوه سرخ با استفاده از شاخص کیفی GQI در محیط GIS، مجله علوم زمین، پاییز 92، سال بیست و سوم، شماره 89، صص175 - 182. 9- نظری‌پور، دوستکامیان، علیزاده؛ حمید، مهدی، سارا؛ (1394)؛ بررسی الگوهای توزیع فضایی دما، بارش و رطوبت با استفاده از تحلیل اکتشافی زمین آمار (بررسی موردی: نواحی مرکزی ایران)، مجلة فیزیک زمین و فضا، دوره 41، شماره 1، صص 99-117. 10- Azaza Hamzaoui, F., Ketata, M., Bouhlila, R., Gueddari, M. and Riberio, L., (2011). Hydrogeochemical characteristics and assessment of drinking water quality in Zeuss-Koutine aquifer, southeastern Tunisia. Environmental Monitoring and Assessment .174(1-4). pp 283–298. 11- Babakhani, M., Zehtabian, G.r., Keshtkar, A. R. and Khosravi, H., (2016). Trend of Groundwater Quality Changes, Using Geo Statistics (Case Study: Ravar Plain). Pollution, 2(2). pp 115-129. 12- Babiker, S., Mohamed, M. A. A. and Hiyama, T,. (2007). Assessing groundwater Quality using GIS. Water Resources Management. 21(4). pp 699-715. 13- Chenini, I. and Khemiri, S., (2009). Evaluation of ground water quality using multiple linear regression and structural equation modeling. International Journal of Environmental Science & Technology. 6 (3).pp 509-519. 14- Edmunds, W M., Shand, P., Hart, P. and Ward, R.S., (2003). The natural (baseline) quality of groundwater: a UK pilot study. Science of the Total Environment. 310 (1–3). pp 25–35. 16- Helena, B., Pardo, R., Vega, M., Barrado, E., Fernandez, J. M. and Fernandez, L, (2000). Temporal evolution of ground water composition in an alluvial aquifer (Pisuerga River, Spain) by principal component analysis. Water Research. 34(3). pp 807–816. 17- Hiyama, T,. (2010). Evaluation of groundwater vulnerability (and susta inability), 20th UNESCO. IHP training course DOI 10. 1007/S 11269-006-9059-6. 17- Jeong, C.H,. (2001). Effect of land use and urbanization on hydrochemistry and contamination of groundwater from Taejon area,Korea. Journal of Hydrology. 253. pp 194–210. 19- Khan, H. H., Khan, A., Ahmed, S. and Perrin, J,. (2011). GIS-based impact assessment of land-use changes on groundwater quality: study from a rapidly urbanizing region of South India. Environmental Earth Sciences. 63(6). pp 1289-1302. 20- Khosravi, H., Nakhaee N.S, and Mesbahzadeh,T,. (2016). Investigation of Spatial Structure of Groundwater Quality Using Geostatistical Approach in Mehran Plain, Iran. Pollution 2, no. 1 (2016). pp 57-65. 21- Kulkarni, H., Shah, M. and Shankar, V., (2015). Shaping the contours of groundwater governance in India. Journal of Hydrology: Regional Studies. 4, Part A. pp 172–192. 22- Liou, S, M., Lo, S. L. and Hu, C. Y., (2003). Application of two stage fuzzy set theory to river quality evaluationin Taiwan. Water Research. 37(6). pp 1406- 1416. 23- Luka, F. and Jonas, L, (2009). Groundwater: Modeling, Management and Contamination. Nova Science Publishers, Inc.
24- Machiwal, D. and Jha, M.K., (2015). Identifying sources of groundwater contamination in a hard-rock aquifer system using multivariate statistical analyses and GIS-based geostatistical modeling techniques. Journal of Hydrology: Regional Studies, 4, Part A.pp 80-110. 25- Pazand, K., Hezarkhani, A., Ghanbari, Y. and Aghavali, N., (2012). Geochemical and quality assessment of groundwater of Marand Basin, East Azerbaijan Province, Northwestern Iran. Environmental Earth Sciences .67(4). pp 1131–1143. 26- Simoes, F., Moreira, A. B., Bisinoti, M. C., Gimenez, S., and Santos, M., (2008). Water quality index as a simple indicator of aquaculture effects on aquatic bodies. Ecological Indicators. 38(5). pp 476-480. 27- Taghizadeh Mehrjerdi, R., Zareian, M., Mahmodi, Sh. and Heidari, A., (2008). Spatial distribution of groundwater quality with geostatistics (Case study: Yazd-Ardakan plain).World Applied Science Journal. 4(1). pp 9-17. 28- WHO (World Health Organization)., (2008). Guidelines for drinking water quality, chemical fact sheets, First Addendum to Third Edition. pp 296-405. 29-Zehtabian, G.R., Khosravi, H. and Ghodsi, M., (2009). High demand in a land of water scarcity: Iran, Water and Sustainability in Arid Regions. Water and Sustainability in Arid Regions. pp 75-86.